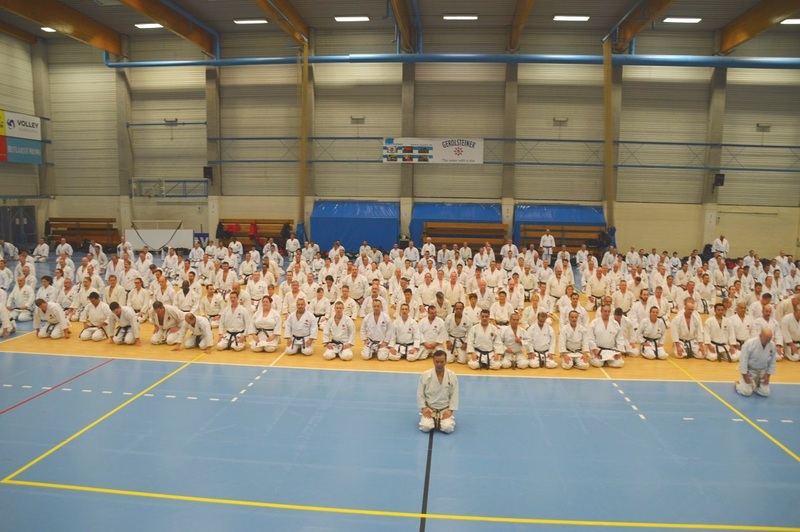 This was the second time that JKA Europe organized a seminar with Ueki Shuseki Shihan and Shimizu Sensei from JKA Headquarters and Bura Sensei as JKA Europe Technical director, together with Gneo Sensei (Chief instructor JKA Belgium) as host. After the greeting ceremony, Gneo Sensei welcomed everybody. 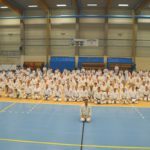 He proudly announced that about 400 JKA karateka coming from 22 countries were present for this 2nd JKA Europe seminar. He mentioned that activities like this, are necessary to stay united all together and to maintain our Budo Karate standards. As times flies by fast we all have to act as one big JKA family who’s working rather together then against each other. We received a well detailed overview of all important items to respect. But ‘kime’ was obviously on the number one spot, while the correct form of techniques and replacements is on number two. We can be surprised of the amount of items that we have to execute correctly as karateka, from head to toe: a view straight ahead, keeping our upper body straight on, shoulders relaxed, twisting the hips horizontally, elbows sliding on the sides of the body, knees fixed in the correct direction, feet completely on the floor, … twisting the wrists at the right moment, the distance between the elbows and the upper body, the use and form of hikite, to contract and relax the muscles … all this as well for the uchi & tsuki waza as for the uke waza. And please not to forget the right distance to our opponent and the stability of the person while performing. 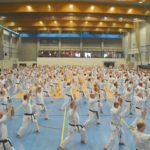 We started from basic techniques: tsuki waza, age uke, shuto uke, … immediately followed by the performance of all stances. 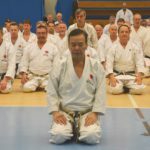 Ueki Shuseki Shihan told as that we all should be able to mention and perform 4 “don’ts” … so rather how we shouldn’t perform things! To end this first day of the seminar, Shimizu Sensei came to teach us the fundamental principles of the keri waza. In karate it’s always necessary to perform well the techniques and replacements in kihon-format. This gives karateka the opportunity to cut away all unnecessary stuff and to come back to the essence of the correct form of those techniques and replacements. And starting from kihon we can go both ways: kumite or kata. This means that all our mistakes out from the kihon, will also be found in our kumite and kata. 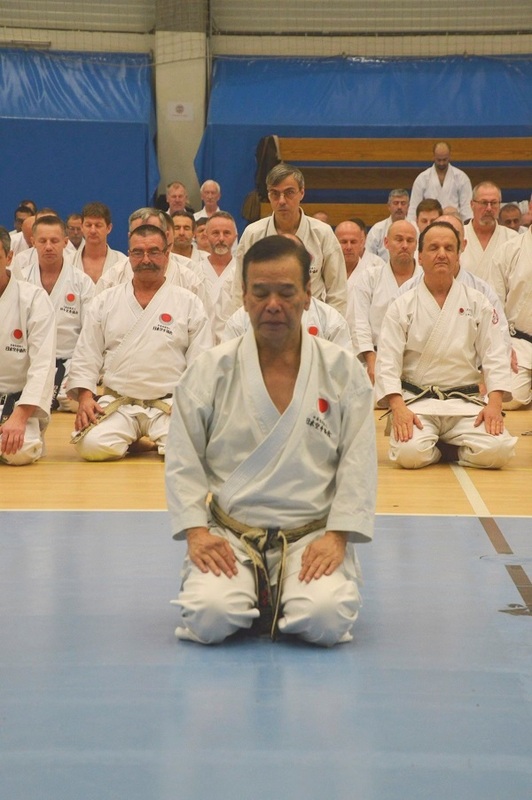 The second day, Ueki Shuseki Shihan emphasized on the true values of the karate-do. JKA karate is more than just karate, it also has 5 values that has to become a second nature. A second nature which will lead to a real lifestyle. But we have to take care that we keep these values of our dojokun at all time. As karateka there is no excuse not to handle to these values, regardless of whether one becomes higher in rank or whatever. So, we can start to be a good example ourselves for our students! All the basics seen during the first day, now came back but in the kata form. But Bura Sensei clearly mentioned that the form alone wasn’t enough. You also have to understand the meaning of each technique and replacement. And therefore all different forms of bunkai are important. And as instructor you should know more than one bunkai for each technique, because it all depends of the situation. 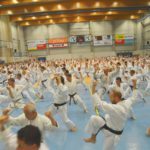 And of course not to forget: the rhythm of each kata is rather unique. So we should be able to integrate all the basics from the kihon into our kata performance. And the soul of each kata perfectly will come out, once that all items match well together. Bura Sensei explained not only the correct form of each technique and replacement, but also presented some bunkai which could be practiced at once with a partner. This way the feeling how to perform was there at once. Ueki Shuseki Shihan and Bura Sensei let us perform both Hangetsu and Jitte. Both kata have their own specific points of attention, besides the basic ones. Hangetsu has the breathing control and the proper stance, while Jitte has all these differents handforms. 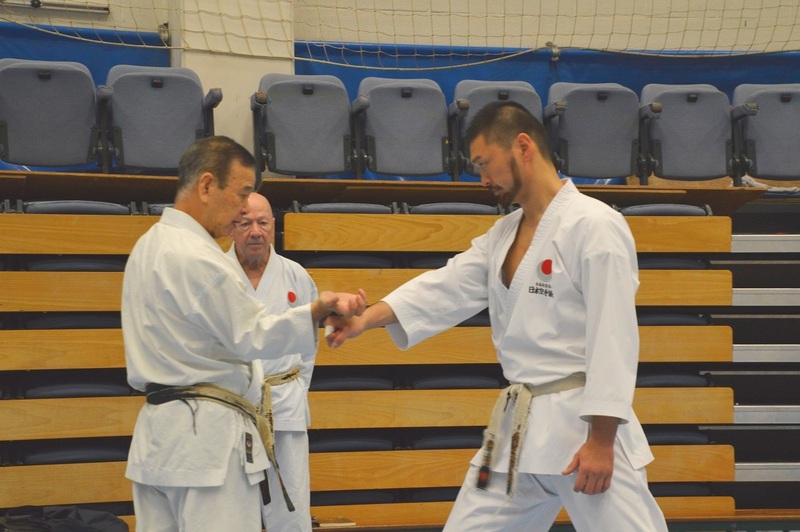 After the break Ueki Shuseki Shihan took off for a kumite session. But, once more starting from the ‘kihon-format’ to build up. He presented several forms of gohon kumite which could be practiced back home at our dojo. But always emphasizing on the correct form in coordination with a proper block and counterattack. Meanwhile always keeping in mind the correct distance to our opponent. 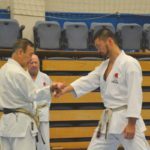 Afterwards Ueki Shuseki Shihan switched to kihon ippon kumite. Here he also offered a lot of possibilities which could be practiced back home at our dojo. But finally we also executed several of those possibilities with different partners. For instance, one of the possibilities contained a form of tai sabaki. Another one was only with suriashi, with the purpose to stay close in a straight line to the opponent for the block and counterattack. To end this seminar we still performed some combinations with uchi waza and keri waza. Ueki Shuseki Shihan therefore requested several participants to count loud and fast. And the counts weren’t fast enough … so we had to count and perform with more speed and dynamic techniques. Ueki Shuseki Shihan became a real drill instructor. After the second session there examinations for judges was held. 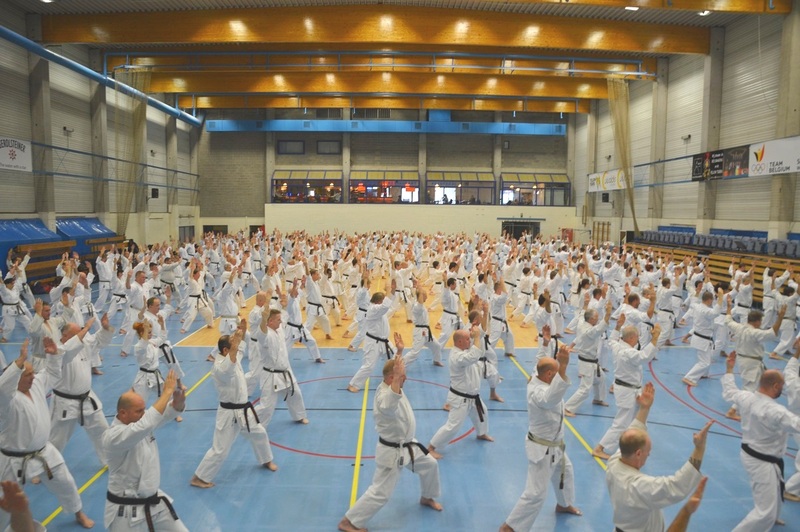 During the final day of this JKA Europe seminar, there were only dangradings and qualifications test on the program for higher dan-ranks. 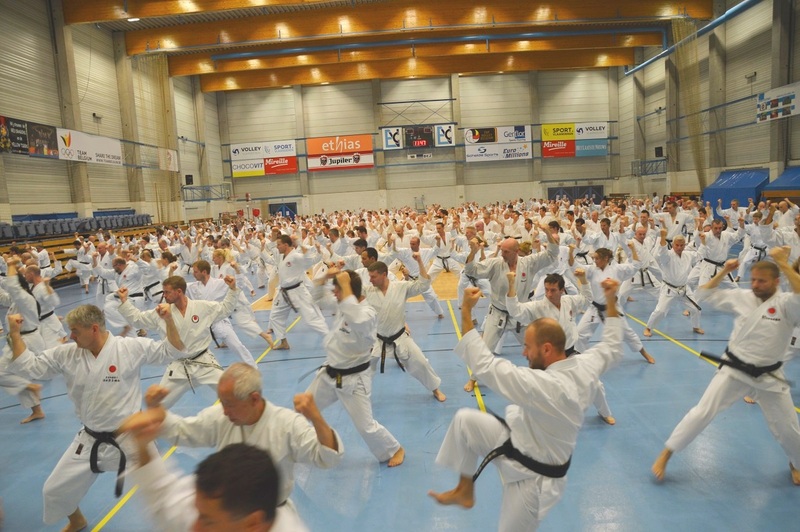 JKA Europe wants to thanks JKA Headquarter for their support for this seminar. Thank you all and see you next time.